On a quiet Zurich cross street, where the most colorful buildings resemble skin tones, Daniel Nufer stands on the sidewalk with a cigarette in hand. As he talks to a young couple from the apartment block next door, he begins edging backwards, past the glass storefront and vintage suitcase stuffed with books, until he reaches his ashtray. It shows signs of earlier use which, by extension, suggests the table and empty chairs aren’t there for show, either. The whole scene is dated, almost pastoral, and for a moment I am confused. Because the last time I checked, I lived in a city of bankers and the year was twenty-fourteen. The first time I happened upon Pile of Books, a few months earlier, was just as disorienting. It beckoned like an Edward Hopper that had come to life and, were it not for the campy Come In, We’re Open! sign on the door, I could have been peering into a person’s private library. In some respects, I was. 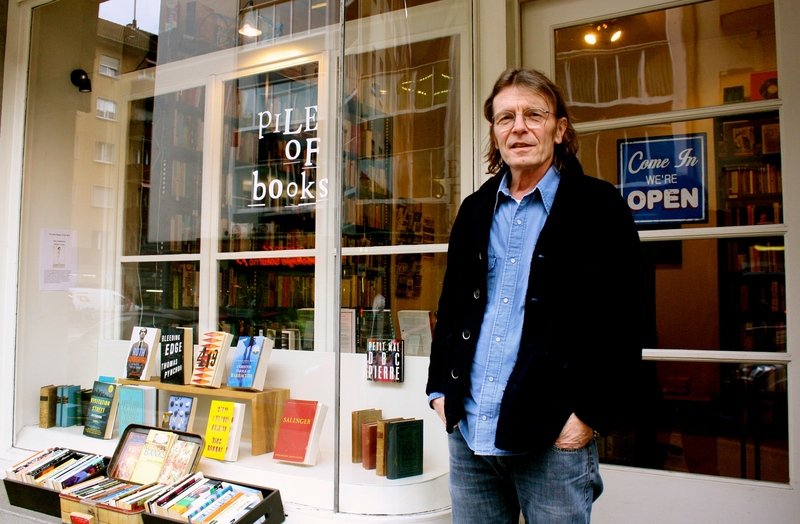 When owner Daniel Nufer founded the bookshop in 2007, the idea was to surround himself with the English books he liked. “I had come into a small inheritance after my mother’s death,” the former social worker explains matter-of-factly. “I figured I could put the money towards a little getaway in Ticino, take a trip around the world … or do this.” This being code for opening a bookstore, with no prior experience in the field, to re-create the kind of hub he was missing because it was no more, or too far. No further comment is needed to spell out the stakes of running a small bookstore while the publishing industry continues to churn. 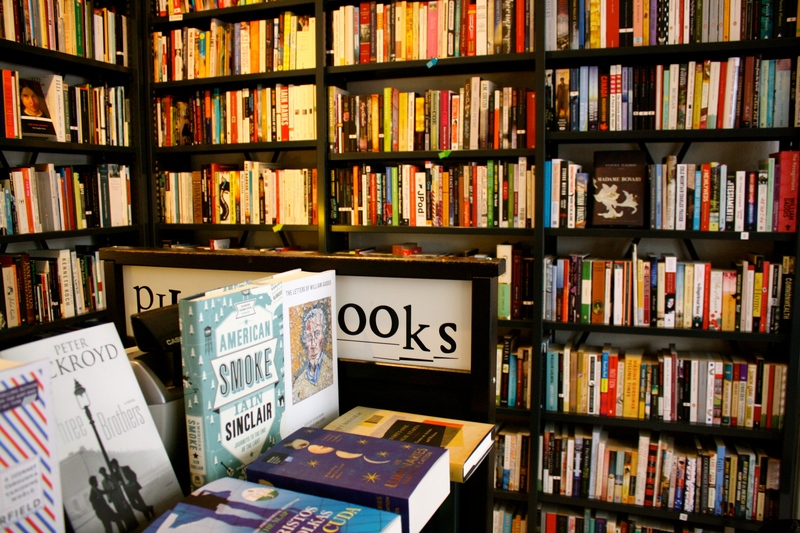 Daniel may be keeping up with the changes—with e-books on the website and a few indie authors on the shelves—but it’s fairly obvious the only people being enriched by the bookstore are its visitors. Even the musicians he convinces to come play among the spines have to settle for a collection basket. Music, in fact, is what delivered Daniel to books in the first place: the Beat Generation writers via Bob Dylan, to be precise. On this particular visit, we trade snippets about Patti Smith, Billy Bragg and a dozen other artists, old and new. I suspect I am talking too much, fueled as much by the crammed shelves of music journalism as the crate or two of vinyl I spotted near the used books. Like a seasoned bartender, he doesn’t seem to mind being on the receiving end of my ramblings. Or, maybe after working with drug addicts and the young and disenfranchised, he can handle a little gushing. It would be easy to label a place which encourages depth over breadth and exchange over transaction as retro. Nothing here, however, feels like rebellion, or almost nothing. NO I WON’T reads the painting on the wall behind the cash register. Spoiled by content yet starved for soul—I didn’t know I felt that away until I walked in. Note: Most of the conversations have been translated from German (or, in the case of the writer, a hopeful variant thereof).